Dependent upon who you ask, Richard Sherman was either an innocent bystander or public enemy number one as recently as last week. 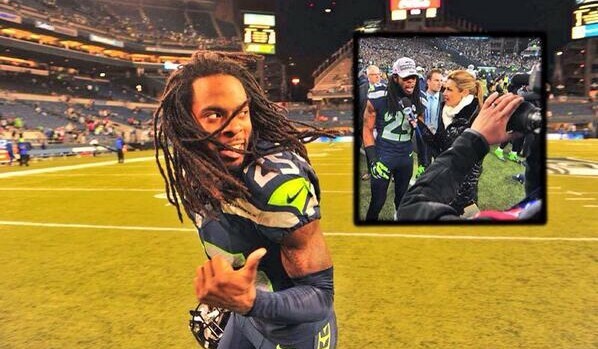 Since Sherman’s passionate post-game interview with Erin Andrews after his Seattle Seahawks defeated the San Francisco 49ers to earn their 2nd Super Bowl birth, media outlets (both social and otherwise) around the world have had Sherman fixed atop their lead story totem pole. Some say Sherman lacked the etiquette of a sportsman, others believed the whole situation was merely the consequence of allowing social media to dictate the news. Nine days have past since the now noteworthy interview, but the dust is still far from settling. Sherman took to his weekly MMQB blog on SI.com to reflect on it all. It’s both informative and honest. Check it out HERE.